Hannah Westerman was one in a group of about 30 singing Valentines that sang to Lampeter-Strasburg students on Valentine's Day. In this installment of In My Own Words, Westerman talks about the experience of being one of the singers. Normally when one thinks of Valentine's Day, images of chocolate, flowers, and hearts pop into one's mind. However, that is not always the case at Lampeter-Strasburg High School. Singing Valentine's occurs annually and is hilarious to both watch and participate. Two groups of girls and one group of guys go around the school all day and sing to people who have been bought a Singing Valentine. I'm the one with the doughnut bun. For friends, this is the perfect way to embarrass one another. So often people see the singers the day of and don't understand the amount of work put into getting the song all ready for Valentine's Day. The groups practice for at least two weeks. Right after practice a majority of the Singing Valentines head to High School Musical practice. That's a lot of singing for two weeks. Being allowed to roaming the halls every period was as exhilarating as everyone imagines it to be. The groups would run into each other every so often and once the girls and the guys raced each other to Mrs. White's room. The songs are always chosen from a wonderful library of love songs. This year the songs were "Signed, Sealed, Delivered" by Stevie Wonder (my song), "For The Longest Time" by Billy Joel, and "You Make Me Feel So Young" by Frank Sinatra. All in all, Singing Valentines is a tradition that everyone, including the singers, enjoy. 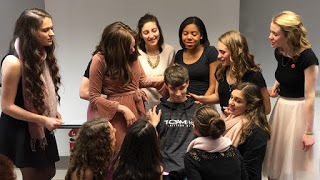 Read our other singing Valentine's article, "Tri-M carries on Singing Valentine tradition of embarrassing fellow students" here.